The forest elder is an attractive, moisture-loving, floriferous tree and it makes a conspicuous feature in the forest patches it commonly inhabits. 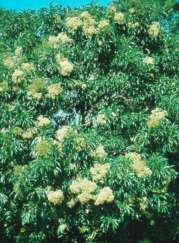 Nuxia floribunda is a small to medium-sized tree, usually 3 m to 10 m tall, although heights of up to 25 m may be attained. The main stem is often somewhat contorted and up to 600 mm in diameter. The fissured bark is rough and flaking and is grey to brown in colour. A lovely dense and rounded crown is often evident, contributing greatly to the visual appeal of the species. 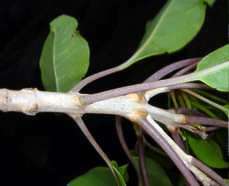 The branchlets are angular and purplish, becoming paler with age. They may be smooth or finely hairy and prominent leaf scars are usually evident along their length. The leaves are simple, 40-160 x 10-70 mm, oblong to elliptic in shape, and taper to a pointed apex. They may be opposite but more often are 3-whorled and this, together with the distinctive red to purple midrib visible on immature leaves, represents a valuable identification feature of the tree. The leaf margins are entire or faintly toothed and are often clearly undulating. The slender leaf stalks vary from 15 to 45 mm in length. 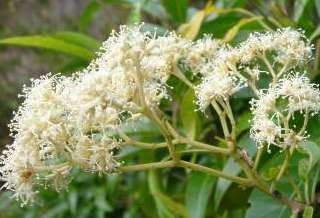 The sweetly scented, cream-white flowers are small in size, around 3 mm long, and are borne in large, branched inflorescences (cymose panicles) produced terminally and in the axils of leaves nearer the ends of the branches. Bracts are around 1 mm in length and both the calyx and corolla are 4-lobed, the stamens protruding. Flowering has been recorded from autumn to spring, mostly between the months of May and September. The fruit is an ovoid capsule that protrudes slightly from the persistent calyx and splits into 4 lobes, revealing numerous tiny seeds. N. floribunda can be readily distinguished from other members of the genus by its large, striking inflorescences. 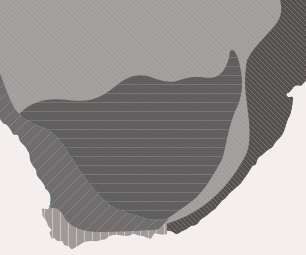 The natural distribution of the species extends from the Cape midlands and Eastern Cape through Kwazulu-Natal, Mpumalanga and Limpopo province to Mozambique and up into eastern and central tropical Africa. It is fairly widespread in forests and on forest margins in the coastal and mountain forest belt, occurring frequently along watercourses (Von Breitenbach 1965). It is relatively sensitive to frost and drought which effectively excludes it from the very cold or arid regions. Cultivation of this species however is now commonplace outside of its natural range. The genus Nuxia is found from South Africa to Arabia including Madagascar, the Comores and Mascarene Islands. It is a small genus with around 20 species in all, five of which occur in southern Africa. 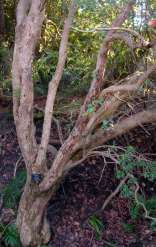 It is comprised of trees and shrubs with bark that is fibrous and stringy. Leaves are in whorls of three, but occasionally are opposite and rarely alternate in their arrangement, and the flowers which are bisexual are borne in terminal or axillary inflorescences. Another species occasionally cultivated is N. oppositifolia. Nuxia previously formed part of the family Loganiaceae, which was a fairly large family of trees, shrubs and climbers, comprising approximately 600 species in 29 genera, spread across various temperate, subtropical and tropical regions of the world (Allaby 1998). Nuxia together with genus Buddleja and Gomphostigma, were moved to the family Buddlejaceae, and now recent molecular studies have resulted in Nuxia being moved again to the Stilbaceae, where it now resides. The genus Nuxia was named in honour of M. de la Nux, a French amateur botanist on Reunion Island, and the species name floribunda translates as many-flowered or flowering profusely, in reference to the floriferous nature of the tree. The very descriptive Zulu name umHlambandlazi literally means mousebird-washer (Palmer & Pitman 1972). The flowers of the forest elder are seen to be self-pollinated as well as by bees in search of nectar and pollen (Von Breitenbach 1965). Numerous other insects also effect pollination and their presence in turn attracts many insectivorous birds. Full flowering occurs usually every second year after which very large numbers of fruits develop. The tiny seeds are effectively dispersed by wind as well as on the bodies of birds, yet many which are still underdeveloped at this stage, fail to germinate (Von Breitenbach 1965). Foliage is browsed by both game and stock. Diseases known to attack N. floribunda include Fusarium spp., which prove fatal to many of the younger seedlings, and leaf moulds such as Meliola spp., which attack and kill older seedlings (Von Breitenbach 1965). The forest elder has a number of useful attributes. As a traditional Zulu medicine the bark is used as a strengthening medicine after a kraal (village) member has passed away, while in other parts of Africa the leaves are recorded being used to treat coughs, colds, influenza, fevers, indigestion, infantile convulsions as well as in rituals (Hutchings et al. 1996). Nectar is produced in abundance making this a good honey tree (Venter & Venter 2002). The wood is a pale yellow, is close-grained and is hard and heavy. As a result it is used for fencing and general carpentry (Van Wyk & Van Wyk 1997), as well as for furniture, turnery and fuel and previously in the construction of wagons (Immelman et al. 1973). The bark is rich in tannins at 5.71% (Hutchings et al. 1996). It is becoming an increasingly popular garden subject, noted for its conspicuous flowers and shapely crown and, with a growing number of plantsmen now offering the species for sale, its economic value is on the increase too. N. floribunda can be successfully grown from either seed or vegetatively from cuttings. Propagation from cuttings involves selecting healthy semi-hardwood or hardwood cuttings up to 100 mm in length (Venter & Venter 2002). These should be inserted into a well-drained growing medium for rooting, suitable media being river sand or equal parts of river sand and compost mix, this latter medium being suitable also for the sowing of seed. The seeds which are very small in size should be scattered evenly over the surface of the medium and very lightly covered with fine river sand. Place in a warm, brightly lit position and keep moist. Germination times generally vary between 6 and 12 weeks. According to Von Breitenbach (1965) the germinative capacity of the seed may however be very low. This species will enjoy a moist, sunny to partly-shady position in the garden but as mentioned previously is not suited to frost-prone areas. In addition, its root system is not aggressive or invasive, allowing for planting in close proximity to roads, buildings and paving (Venter & Venter 2002). Plant in deep soil with plenty of compost. Given these favourable conditions, N. floribunda is a medium to fast grower. Its very attractive nature makes it a winner in most gardens where its lovely presence is sure to be felt. Allaby, M. 1998. A dictionary of plants sciences. Oxford University Press, Oxford. Hutchings, A. et al. 1996. Zulu medicinal plants: an inventory. University of Natal Press, Pietermaritzburg. Immelman, W., Wicht, C. & Ackerman, D. 1973. Our green heritage: the South African book of trees. Tafelberg, Cape Town. Palmer, E. & Pitman, N. 1972. Trees of southern Africa, 3 vols. Balkema, Cape Town. Pooley, E. 1993. The complete field guide to trees of Natal, Zululand and Transkei. Natal Flora Publications Trust, Durban. Venter, F & Venter, J-A. 2002. Making the most of indigenous trees. Briza Publications, Pretoria.